BIG NEWS for the month of April! I've already talked with some of you about this, but I have some big news regarding April. As the proud new owner of health insurance, I will finally be getting hand surgery to remove a ganglion cyst. The surgery will take place on Friday, April 4th; after this, I will be out of the office until Tuesday, May 6th. But it's not all surgery and woe! During my recovery, Greg and I will be going to Ireland for a couple of weeks as a belated 10-year-anniversary present to ourselves. As a bonus, one of my dearest friends from college (along with her husband and family, who are also made of awesomesauce) live in Dublin, so I am looking forward to a wonderful and long-overdue visit. I have arranged for one of my colleagues, Jenn Stone of Awaken Massage Therapy, to cover my practice during my absence. Jenn and I went to the same school; she's an excellent therapist and I trust her to take care of you guys. She's even in the same suite, so there's no hassle in trying to figure out where to go. - Please make sure to inform Jenn that you were referred to her by me. - New or returning clients will be directed to Jenn while I am out of commission. - Clients on the frequent flier plan may either see Jenn at the regular, discounted rate, or may skip a month and wait until I'm back. Those who choose to wait until May will keep their discount with no penalty. - Gift certificates and pre-paid packages purchased through Heartfire Massage may not be redeemed with Awaken Massage Therapy. Expiration dates for these items will be extended a month to make up for the lost time. Clients are still welcome to schedule appointments with Awaken Massage Therapy, but payment must be made at the time of service. - Other restrictions may apply as I think of 'em, 'cause I'm tricky like that. Because I never have enough on my plate, I have a couple of really cool activities lined up between now and surgery. Why am I telling you? So that you can take part! I've wanted to perform in the Steamboat Dance Theater's annual concert since the first time I saw it, and this year I AM. *cue excited squeeing noises* I'm in a piece involving a lot of prop manipulation: poi, hoops, staff, and so on. Performances are March 20-22 at 7 pm, with an additional matinee at 1:30 on Saturday. Tickets ($15-20) are now on sale and as always, volunteers are needed, so come on out and support your local dance community! If you like our SDT piece and want to see more--or missed it entirely--I'll be celebrating the last weekend before surgery by going out with a bang! Once again, I'll be performing at YVSC's Earth Hour celebration. Instead of spinning LED glow poi like at SDT, this time I'll be playing with fire. 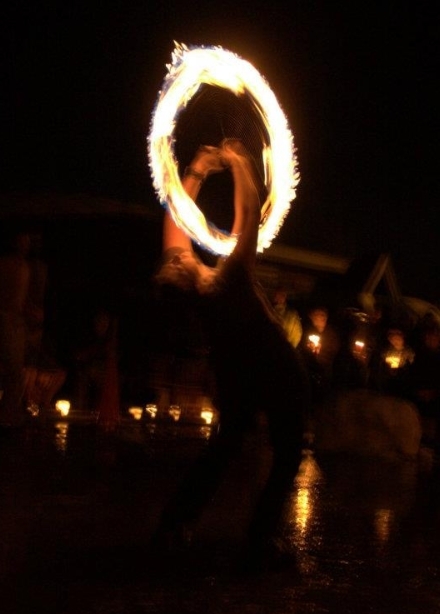 This is an all-ages event--because, of course, what's m ore kid-friendly than adults dancing with fire?--including a student forum hosted by Emerald Mountain School. In the realm of "knowledge is power," it seems that an intact goat buckling can reach sexual maturity in less than six months. How do I know this, you ask? W ell, let's just say we learned the hard way. Good thing "the hard way" is so ridiculously cute. May spring bring you as much joy as a bouncy baby goat!